I don't remember ever seeing such a fabulous Christmas card. I'll never throw it out - it's already stuck to my 'fridge - because it perfectly captures the atmosphere of my childhood Christmases. And that's me, the chubby one, on the floor with my hand in the bag of crisps. The artist is Marius van Dokkum and I was so curious about him that I checked out his site. Have you ever just "clicked" with an artist? I often do. Perhaps the one whose paintings I can admire for hours on end is Hieronymus Bosch. But now there's a new boy in town. 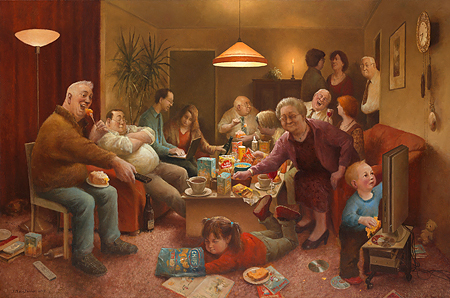 Marius van Dokkum's work will provide me with writing inspiration for many years to come. I can feel it in my bones. How lovely. This one! Though I prefer his landscapes.